Now i am curious what constitutes a strolling gig. I suppose there are better things to be curios about. I would consider a strolling gig to be one where you stand/walk around a bit. I guess i was trying to imagine specific examples. A mariachi band seranading in a fancy restaurant, is all i am thinking of right now.... Surely there be more realiatic examples. For extra credit.... what's a trolling gig? And sorry for my misspelling of curious. Not always good at proof reading. Look at sousaphones. Anywhere you see them, the customary performance posture for some if not all venues is on feet, whether moving or not. New Orleans jazz, Balkan brass ... never done any banda, but it's bound to have some stand up work. 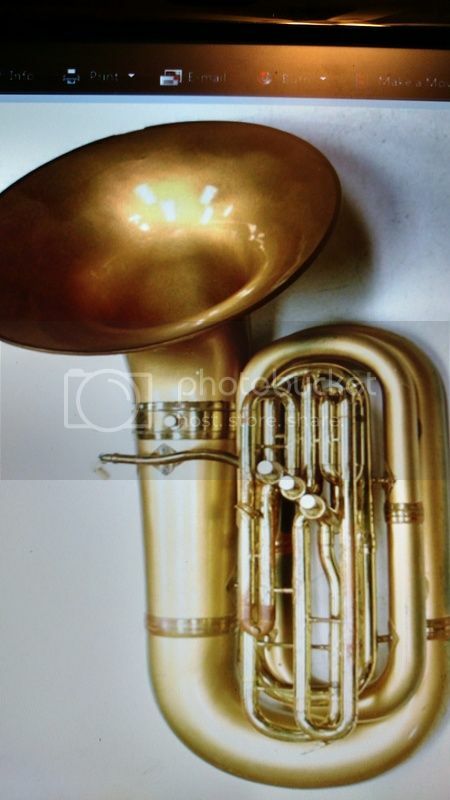 A tuba like this one might serve in a pinch. I looks surprisingly un-Reynolds to me, though, despite the engraving on the collar. Body & bell shape is different; valve section at least has a similar angle, but some differences compared to photos of common Reynolds models, like width of main slide. I suspect, though don't know for sure, that Martin may have made these for Reynolds. the ferrules look Martin, a few of the slides look Martin, and the articulating leadpipe (bits) say Martin. And, we know Martin made some fiberglass tubas. These horns are from when Reynolds and Martin were both under the RMC umbrella, so these fiberglass horns were branded as both Reynolds and Martin. Yup. The photos even show the Martin tuning bits. Yeah the bits are a dead giveaway, signature Martin. By the way, I am in reasonable distance to this horn and I really want it. I already have a Martin Mammoth tuba and sousaphone so it just makes sense to add this gem, right? SousaWarrior9 wrote: By the way, I am in reasonable distance to this horn and I really want it. I already have a Martin Mammoth tuba and sousaphone so it just makes sense to add this gem, right? It makes perfect sense. In fact, it wouldn't make sense for you not to buy it! May or may not - if your suite is to be all Mammoths, then this one wouldn't fit, it's just ordinary 4/4 size, am I right? Correct, the fiberglass horns are only 4/4. I was referring to having an all-Martin stable rather than an all-mammoth stable, I should've been more clear on that. I really have taken a liking to Martins in general and I think a 4/4 would pair with my Mammoths(s) nicely for smaller ensembles. Plus it's fiberglass, how cool is that?! SousaWarrior9 wrote: Yeah the bits are a dead giveaway, signature Martin. By the way, I am in reasonable distance to this horn and I really want it. I already have a Martin Mammoth tuba and sousaphone so it just makes sense to add this gem, right? Your logic is undeniable. You have my full support. There is one for sale at Dillons now. Do they play reasonably well?? Harvey Hartman ("Harv's Happy Horns") had a fiberglass Martin. He said it was the best tuba he owned. Strolling gigs include the Italian festivals of New York City and probably elsewhere. Also, the Chinese population of NYC hires the strolling "Italian" bands (really mixed national, racial, and religious background, like all else in the Big Apple) for funeral music. It's a pretty cool horn. YORK-aholic wrote: I recently bought an all brass one of these. I'm really disappointed I missed out on this horn. I've been enjoying my Mammoth tuba and sousa so much that I've been considering converting my tuba collection to be all Martin (I'm addicted to the Martin sound!) but the Martin 4/4 or 'medium' horns as they called them (fiberglass or otherwise) have been so hard to come by. If anyone out there who has one of these old Martin 4/4 horns (again, fiberglass or brass) and may be interested in a really nice King 1241 with both bells, I may be able to help you out. Three Valves wrote: There is one for sale at Dillons now.